Yesterday when I was at the Tallulah Rose Flower School in Bath, the students and I discussed the importance of having a great website to promote your floristry business. 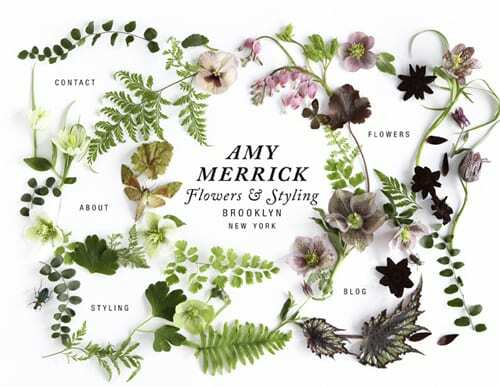 So I thought I’d start off with the beautiful website of New York based, floral designer, writer and stylist Amy Merrick. 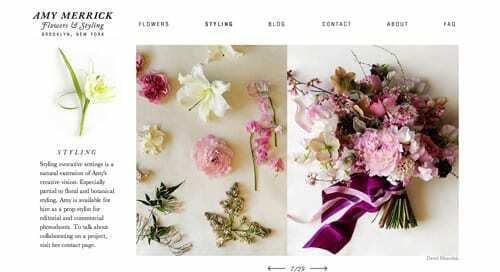 I remember reading Amy’s blog post over two years ago announcing the launch of her new site for her floral design and styling business. She shared the process of how it was designed from scratch…from putting the original concept together and her inspiration, to working with a graphic designer, photographer, web designer and copywriter. The blog post is well worth a read! To start with, the home page is like no other that I’ve ever seen…it’s totally unique and portrays Amy’s personal style perfectly. I love the fact that the options on the home page, like Flowers and Blog, aren’t in tabs in a straight line at the top of the page…but your eye moves around the screen in a circular motion reading the different options in turn. And I adore the simple, clean, crisp design…with lots of white space. Thank you! I too love Sarah’s site! :-). 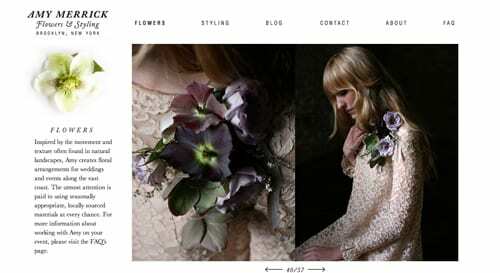 What a beautiful website Amy has… I love the way the flowers and foliages are displayed (am quite jealous)!!! I have always loved Matthew Dickinson’s website, it has muted tones with stunning pictures. I was going to post you a link and then I saw that his site was under construction. I wonder what he has planned? !